It's not often that pictures of a bus are captured before it leaves the factory where it was built......but here is one. The photo turned up quite out of the blue on a stall at the Llandudno Transport Festival in 2007. It has been identified by an ex-Park Royal Vehicles painter as having been taken outside the paint shop, which occupied the long building running down to the Grand Union Canal from the old assembly shops. Quite why it was taken, and by whom is open to speculation. It is possible that she was the first vehicle to be completed, as they did not arrive at the end of the production line in order of chassis number. Either way, it is a gem of a photo and shows the original condition, literally ex-works. Keen-eyed readers will notice the naked chassis of a sibling poking her nose into the photo. An official photograph by PRV captures fellow SM119 against a more flattering background, and in such detail that you really can count the rivets. The initial 48 country Swifts were delivered in May and June 1970 to London Transport at Aldenham, as requested when they were ordered. After preparation, they were dispersed to their operating garages at Leatherhead, Guildford, Addlestone and Crawley. 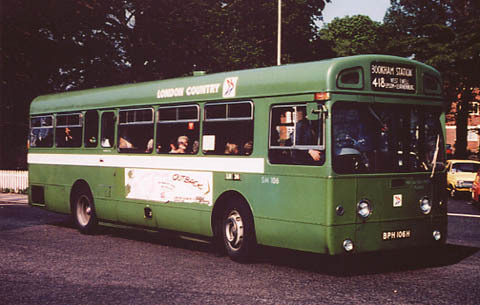 SM106 entered service on 17th June 1970 on route 418 from Leatherhead garage where the Swifts replaced RT type vehicles. 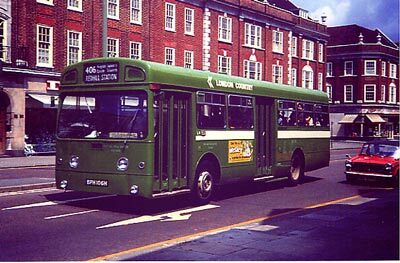 This was the first major one-man conversion implemented by London Country, but from 1st August the Addlestone and Guildford vehicles not only converted routes to OMO, but rendered extinct the fleet of low-height double-deckers that were used to cope with low bridges on those routes (visit the TIMEBUS website for all the information you could wish for on RLH vehicles). Initially, drivers refused to allow the use of the centre exit as there was insufficient visibility of passengers alighting, depite an extra internal mirror by the centre doors. It would be great to say that the new buses were a success, but that was not how it turned out. Unreliabilty resulted in regular substitution by a hotch-potch of owned or hired vehicles, including the RT's which they should have replaced! 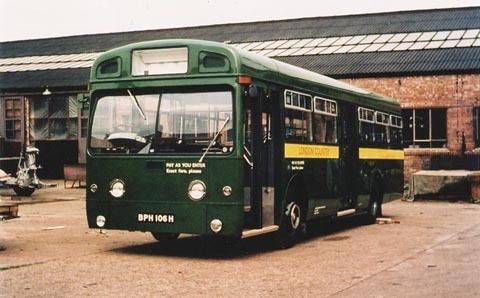 SM106 was repainted into National Bus Company green livery in May 1973 and received a complete overhaul at the Tinsley Green Works in 1976. Records obtained from the DVLA show that SM106 was de-licensed during September and October of that year. Only 38 country Swifts ever received a full overhaul, since the class was earmarked for early withdrawal and from mid-1977 only the minimum work required for recertification was undertaken. SM106 spent her entire working life at Leatherhead, whose principal SM route was the 418 to Kingston which required a weekday run-out of a dozen buses. It should have been the case that RF routes were taken over as well, but vehicle shortages meant that mixed working was the norm. 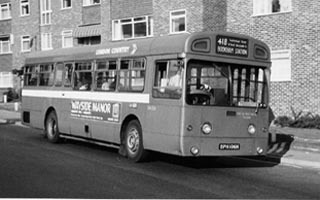 The other regular route was the 406 on a Sunday, which was operated by one-man buses following a pattern started long previously by London Transport. 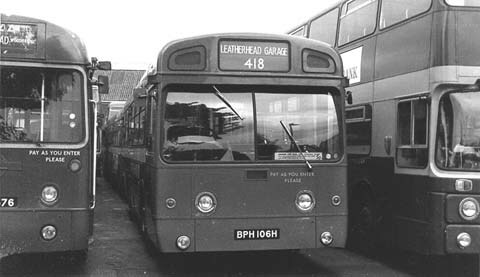 It is surprising that Leatherhead should have had any allocation to the 406, as the garage was so far off route, but two out of every three buses required for this route's operation were LH based. Some strange anomalies occurred where green and red routes mixed, as the country area had a divergent fares structure, and from 1974 onwards there were no child fares in the peak period. Other towns, such as Luton, had special arrangements where routes shared roads with other operators. For example, the 321 was not allowed to pick up or set down passengers for journeys within the town boundaries. 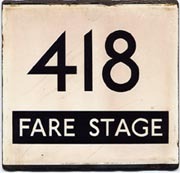 In the picture above, SM106 has a slip board with the following, rather obscure message: "MINIMUM FARE Route 418 TOWARDS EPSOM from all points between KINGSTON STATION and SURBITON Assembly Rooms 5P". Discouraging short-riders is obviously the idea, since seats for Ewell and Epsom were valuable, but I am surprised that the boundary is not that of the GLC, which was at Tolworth. Similar notices appear in the photos below, but are illegible. I was alerted to the next photograph by Neil Fraser of the AEC Society. I purchased a copy from the late, lamented FOTOPIC, but the site was such a chaotic mass of un-titled and un-tagged images that finding the right picture was like a trip up the Amazon! The album containing this image comprised 2500 LCBS images, and maybe the lack of organisation was part of the problem which led to its demise. I have obtained several original images by contacting contributors directly when possible, and that policy has paid-off).The condition of the vehicle, all one shade of green, and apparently un-dented suggests that it dates from soon after its first painting into NBC livery. On the side between the doors is advertising for Wisley Gardens, and that advert might be carried in the photos above as the nearside is not visible. The location is easily recognised as the eastern end of Epsom High Street, and is essentially unchanged today. Once again it is a Sunday 406 duty. The photographer was standing with his back to the shops on the Town Hall side of the road, so this is a midday or early-afternoon shot. SM106 is about to turn left into Ashley Road. This section of the High Street was not traversed by the 418, which turned into Waterloo Road under the railway bridge and along the Hook Road to West Ewell as it pursued its labyrinthine course to Kingston. The 406, in contrast, went straight up the main Epsom Road to Ewell and then the Kingston Road to Tolworth. The next photograph turned up at Manchester Transport Museum's 2007 London Bus Day, which I attended with Dave Thrower (enjoying a truly REGAL journey up from Warrington on RF508). This is harder to date as the livery has faded, but notice the two-coloured NBC logo on the roof and front dash, which appeared from 1975 onwards, and the King & Flack destination blind with upper case via information on two lines. OUTBACK fares are advertised on the side at 40P, so there is a clue for someone who knows when that would be current. I am guessing that this might be after overhaul in 1976, but since the trees are in full leaf it would be summer 1977. If that is the case, then it is near to the end of the LCBS road for her. Some while later (May 2012) Richard Mercer found the negative among others being scanned for reproduction, and presented me with a much better copy, and was able to tell me that it is one of Geoff Rixon's. Unfortunately, Geoff's memory let him down regarding the location, and there is not a lot to go on. It looks superficially like a railway station forecourt, but it does not match any of the stations that a 418 called at. I was amused to find that the bijou chalet taxi-shelter by the footbridge at Bookham Station (terminus for the 418) was still there in 2016 - according to Google StreetView. 6. There is a lamp standard on the street corner. Points 1, 2 and 3 would identify it to a regular driver, and in fact if the route is examined carefully there are only four places matching point 2, most of which can be ruled out quickly. Finally, only one location is recognisable in StreetView with an appropriate fence, though they are not the most durable street furniure, I know. Favourite was opposite the foot of Epsom Station Approach, a delightfully wooded location due to trees growing on the railway embankment, with a low-rise building set well back from the road. The lack of traffic lights at this location was a negative, and the route did not serve the station, but I considered that the driver might be moving to the outside lane approaching the turn into High Street. Whether the multi-storey buildings fitted was a major stumbling-block because that area is now the approach to the car park of the Ebbisham Centre, built in the mid-90s. Thanks to a fantastically quick response from the Epsom and Ewell History Explorer web site that theory was dispelled overnight, although so much about the location fitted well. So back to StreetView and at the top of Maple Road, Surbiton there came a flash of recognition from the complex of flats on the corner of Surbiton Hill Road and Beaufort Road, and the realisation that Geoff's picture clearly shows a large cedar tree in front of art-deco flats - which are King's Keep. The problem is the fenced property, which has been re-developed as a preparatory department for Surbiton High School with a tall and very distinctive clock-tower. There is still a lamp standard in the same location, which is fairly permanent because of the wiring that has to exist for it to work and all the complexity of positioning street furniture at junctions. The profound irony is that Geoff had his back to the iconic Surbiton Assembly Rooms (see above in relation to 5P fares) which would be laughably recognisable. The power of the Web is such that I was also able to read that Beaufort Road hit the news at Easter 2016 when Storm Katie (I wonder what strength on the Beaufort Scale was indicated?) felled a large part of that cedar tree and closed the road for most of a day. As for the decorative brickwork visible through the bus windows, even though the building has gone the same pattern of decoration is found on the next extant property on Beaufort Road. This was a good spot for bus-spotting because there was a 406 every 15 minutes, 418 and 71 every 30 mins, 714 and 727 Green Line services every hour, and in both directions, of course. We will never see the like again! SM106 was off the road again from December 1977 until March 1978. The arrival of sufficient Leyland Nationals to cover SM duties at Leatherhead in October 1978 meant the end of active service for London Country and, along with a large number of other SM vehicles, SM106 was sent to Romford garage for storage and disposal. 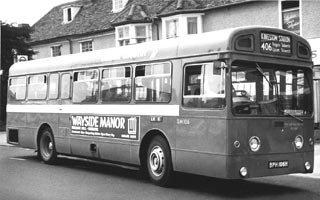 The vehicles which had been overhauled recently were more attractive to customers, and SM106 was soon purchased by Ensign at Grays, change of ownership being registered on 15th January 1979. BACK ......to the BPH index.